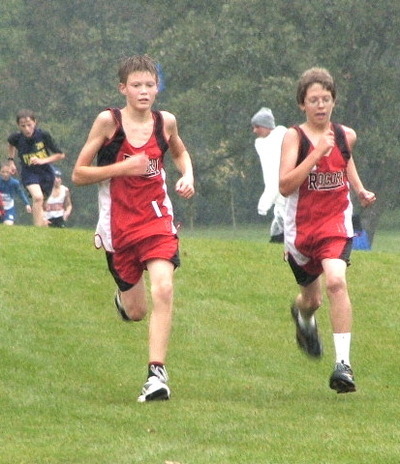 This story provides a glimpse at the only home meet for the 2006 ROCORI Cross Country team. The weather was dreadful combining the elements of cold, rain, and extremely windy conditions for the runners. If you have never been to a C.C. event its truly a site to see. The runners go all over the course, up hills, down hills, and around sharp corners. This year's team is having a very promising season with many runners finishing in the top 20. 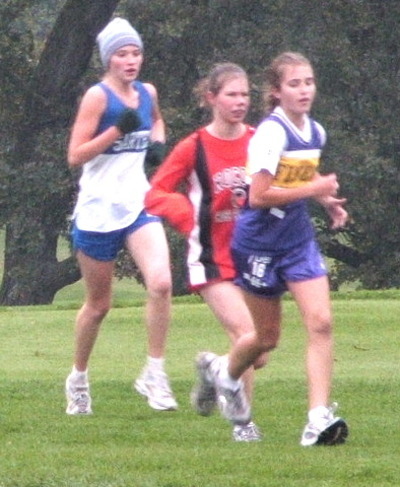 Wind and rain were uninvited guests at the 2006 Rocori Invitational cross-country meet held this past Thursday at River Oaks Golf Course in Cold Spring. The athletes endured some of the worst weather the season has to offer, with the exception of snow. Ten teams including Alexandria, Bemidji, Fergus Falls, Little Falls, Moorhead, Rocori, St. Francis, Sartell/St. Stephen, Sauk Rapids/Rice, and Tech competed, with Moorhead taking first in all six of the varsity, JV, and junior high events. Varsity girls were led by Caitlyn Dingmann in 10th place (16:28) and Caitlin Schnettler in 14th place (16:40) out of 69 runners. Varsity boys were led by Scott Fischer in 17th place (18:18) and Joel Gregory in 31st place (18:47) out of 67 runners. JV boys were led by Justin Boldt in 54th place (22:19) and Eric Folwarski in 60th place (22:26) out of 96 runners. Junior high girls were led by Raija Eskuri in 15th place (15:02) and Kristin Kotzer in 20th place (15:41) out of 51 runners. Junior high boys were led by Corey Krey in 8th place (12:55) and Jason Stice and Trek Frantti in 46th (14:41) and 47th (14:42) place out of 83 runners. Runners in the top ten places earned medals. Winning teams took home Cold Spring Bakery cakes so Moorhead had plenty to eat on the bus ride home. Kristen Kotzer battles her way between two competitors. Runners with season best times at the Rocori Invitational included: Brianna Larison, Katie Massmann, Mandy Heinen, Tracy Sklucazek, Kaia Lahr, Kirsten Meier, Kirsti Orbeck, Kate Dockendorf, Ellie Schorn, Trent Eisenbacher, Joel Gregory, Charlie Harren, Ross Brink, Joe Holan, Justin Boldt, Eric Folwarski, and Mike Holbrook. Tracy Skluzacek is the only Rocori runner who has performed at a season best level in all five meets this fall. Next closest to Tracy's record are Trent Eisenbacher, Adam Kollmann, Anton Young, Mike Holbrook, Brianna Larison, Katie Massmann, and Caitlin Schnettler with season best times in four out of five meets. Comparing this year's times to last year's times on the same River Oaks course demonstrated many Rocori runners improved since last year; and some improved significantly. Runners with reduced times from last year include: Ross Brink (6:34), Ryan Meyer (4:26), Katie Massmann (2:05), Tracy Skluzacek (1:27), Mandy Heinen (1:19), Anton Young (1:05), Charlie Harren (1:00), Michaela Nordstrom (:37), Kristin Kotzer (:36), and Caitlin Schnettler (:20). These are great reductions considering the terrible weather conditions they encountered this year. Trek Frantti (L) and Jason Stice (R) race their way to the finish line. Our runners will be very busy this week with two meets on the schedule. Tuesday's meet starts at 4:10 PM in Albany (at the high school) and Thursday's meet starts at 4:30 PM in Paynesville (on Koronis Hills Golf Course). Let's hope they've all warmed up after the chill of last week and they perform to the best of their abilities. 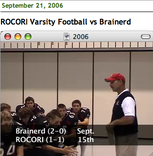 The weekend of September 29th, 2006 was Homecoming at ROCORI High School in Cold Spring. The ROCORI Marching Band and Color Guard performed during the halftime show at the Friday night Varsity football game. The group is in the middle of their Fall Field Show season. The show this year is entitled: "Phantom of the Piano Studio". We used two cameras to capture this performance and we think you'll enjoy the results. Special thanks to Pat Grelson for her super camera work up on top of the press box. It was the team section finals at the Golds Gym in St. Cloud. ROCORI girls have a very good team and were one win away from its first ever state tournament birth in their short history. The girls team is a mix of seniors and juniors and even one 8th grader. They were unable to pull it out against St. Cloud Tech but what a great season for these talented group of girls. This was the best season ever in the history of Girls Tennis at ROCORI. Last year the team won more games than they lost for the first time ever and this year's 14 - 5 season shows that Girls Tennis has truly arrived in the "Land of ROCORI'. * ROCORI Girls Tennis Team selected for the Sportsmanship Award by the conference. Sportsmanship is expected in all activities. It is the responsibility of coaches/advisors, participants, cheerleaders, students, adult spectators, officials and media. Promotion of sportsmanship at activities should include a demonstration of respect for opponents and officials. Rules of the event should be respected and skill and performance should be recognized regardless of school affiliation. Sportsmanship is a cornerstone of any quality activity program. Located in Richmond, Plantenberg Food Pride is a 4th generation family owned grocery store. Plantenberg's prides itself on fresh, quality foods and friendly customer service. ROCORI traveled to Sartell to take on the Sabres in the Section Semi-final game. It would be an ugly first half for ROCORI. Their defense would step up to the challenge and keep the Spartans in the game against a very difficult Sabre team. It's a new half and ROCORI looked completely different. It was a half of unexpected. Brad Olson got injured and the Spartans had to bring in their third string QB, who brought them back from the dead. Derek Eisenschenk was the MVP for the Spartans in this game but they wouldn't be able to come from behind. Great season guys. 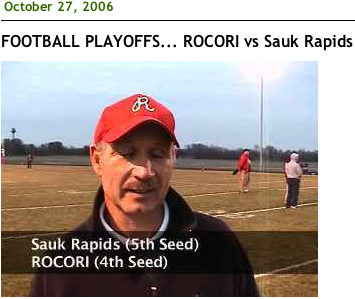 Its ROCORI vs. Sauk Rapids round 2. 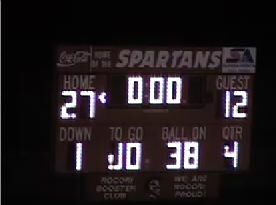 In the first meeting ROCORI beat up the Storm rushing for over 300 yards. Today would be a completely new story as it was the Storm who came out running over the Spartans. It was a ugly first half with no one team really gaining an advantage. Its a completely new half for the Spartans as they finally would show why they had home-field advantage to begin with. ROCORI would extend its win streak to 4 as they would dominate the second half. 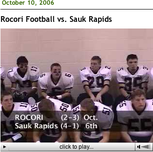 ROCORI once again rode the backs of Alex Jungels and Nick Schneider to win this game. Its the regular season finale for the ROCORI Varsity football team. The Spartans come into today's contest 4-3 on the season. ROCORI is trying to build some momentum as the playoffs role around. The first half would be the only have either team would score and the defense was stifling for the Spartans. 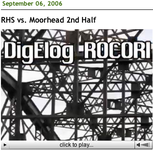 The final half of the 2006 season wasn't the most of entertaining but it really showed how great the ROCORI defense is. The Spartans recorded their first shut out of the season as they rolled 21-0 over the Eagles. With a 3 game winning streak, ROCORI heads into the postseason with everything in the right direction. It was a great regular season for the team and we wish them the best in post season play. After a first half battle royal that had ROCORI ahead of Sauk Rapids by only one (7-6), during the second half ROCORI pulled away and dominated play on both sides of the ball winning 27 to 12. Stay tuned for highlights of the game during the next few days. Its another great game between the Spartans and the Cardinals. This time its senior night in Willmar and its absolutely freezing out. The weather was dreadful and the game was old fashioned, with each team relying on hard hits and great defense. ROOCRI would start with the ball and had a nice drive but at half things would be knotted at 7. With things tied at 7 it would be another dog fight for the Spartans. Would they win a close one or would they lose another nail biter. The Defense that has been there all season for the Spartans would be called upon once again. The offense though ineffective for most of the game would find their flow when needed. They would advance to 4-3 on the season and now, for the first time, have a winning streak.